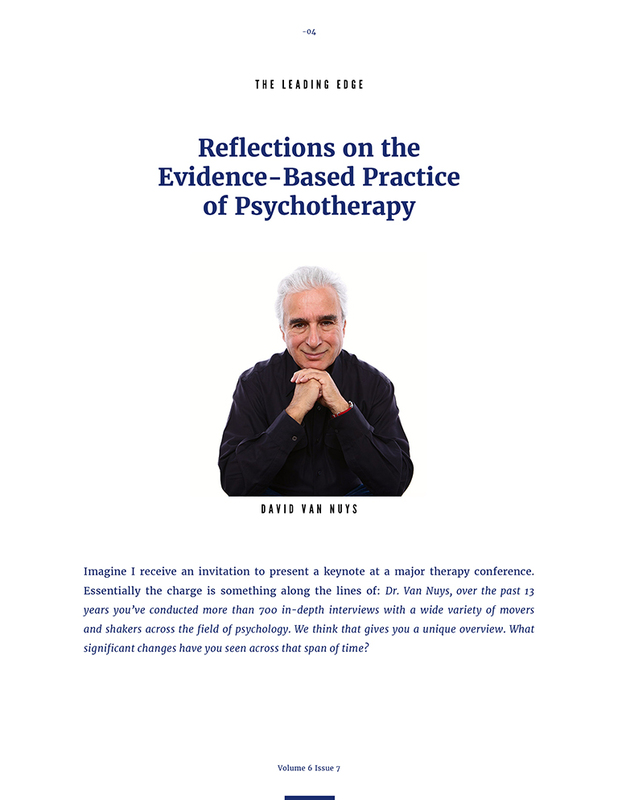 Dr. Van Nuys, over the past 13 years you’ve conducted more than 700 in-depth interviews with a wide variety of movers and shakers across the field of psychology. We think that gives you a unique overview. What significant changes have you seen across that span of time? I say “imagine” because I’ve not actually received such an invitation, but I have had such reveries in the shower, where I’m prone to such daydreams of glory. With the hot water beating on my head and shoulders and stimulating my fantasies, it occurred to me that the advent of evidence-based practice is one of the most interesting developments in the field. I guess the reason I find it interesting is that I’m surprised to see that evidence-based practice has taken hold to the extent that it apparently has. I must confess that when I first heard the term I was skeptical. It seemed like the sort of good idea that people would pay lip service to but not much more. Fortunately, I would not have to take it too seriously inasmuch as I hadn’t practiced as a therapist in quite a few years, having embraced an academic career. Also, as a humanistically inclined psychologist, I tended toward the belief that psychotherapy involves processes too varied and subtle to lend themselves to any sort of meaningful quantification. I’m more of a qualitative research guy than a quantitative guy. To keep my confessional honest, I should add that my defensive reaction to the idea of evidence-based practice betrays a certain intellectual laziness on my part. I take this to mean that the evidence-based folks and the therapist folks come from different underlying world views.